A new WinSwim Wiki - site for documentation and best practices. Decided to go to the paradyme of having a WinSwim Wiki site for the documentation and let the users contribute to creating the documentation that meets their needs. We're going to take the quick start guide and migrate it to the WinSwim Wiki site and then depreciate the quick start guide. If you lose a serial number or keycode click here to search our records for the lost serial number and keycode. The conversion from Hy-tek to WinSwim can be accomplished very simply by the importation of a set of meet entries that contains all the athletes. As part of importation of the entries; WinSwim will automatically create the Team, Meet, Event, Entries and Athletes. Another technique would be to create a new database and then import the LSC registration SDIF file into WinSwim. WinSwim will then automatically create the team and athlete records for you. Now have a quick start guide that is in Adobe Acrobat format that can be used to get a quick start to setting up WinSwim. click here (1.9 MB) for the quick start guide. 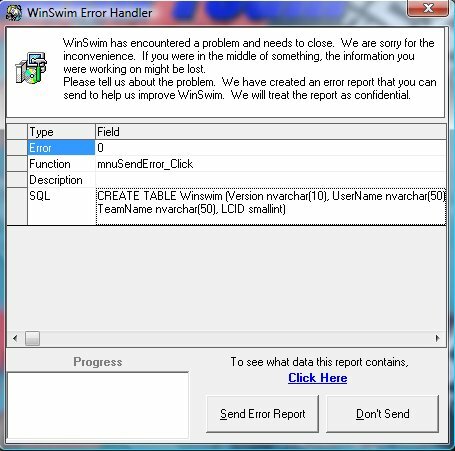 WinSwim is quite complex with many places that errors can happen. I do not want these faults to just pop up a dialog and never hear about the problem. So, there's special code in WinSwim to make reporting these failures easy. If you see the dialog below, a unanticipated error occurred. I want to see the results of these errors and encourage you to press the "Send Error Report" button if you have an active Internet connection. I will fix this immediately! The dialog will capture the error and forward to WinSwim support. You can see the information captured by pressing the "Click here to see debugging information to be sent". By forwarding this information, your error will be researched and resolved immediately; not in the next update or next year.